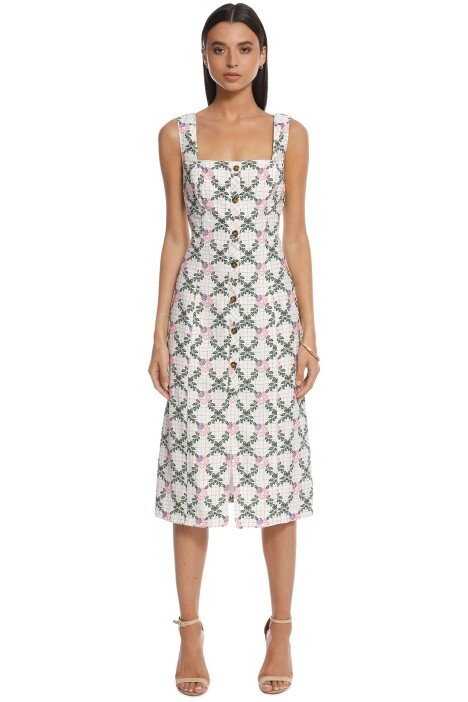 The epitome of floral perfection, this cute midi dress by The East Order is a must-have! Crafted in thick fabrication, it features a front button closure and wide shoulder straps. Hire this floral number for an upcoming daytime event or date night. Go for tan block sandals and a striped foldover bag available to rent. Complete with relaxed curls and keep makeup simple with a pearl highlight. Head over to our blog and read our post on how to transform your day look for a night out! Founded in 2017, The East Order is an Australian womenswear label that is reflective of the laidback nature and beauty of Byron Bay. Known for their effortlessly cool off-duty pieces, The East Order’s collections are influenced by the local coastal nature and aim to celebrate the feminine form. A trusted go-to for contemporary and summery pieces that can take your look from day to night.